Malta, situated at the center of the Mediterranean only 70 miles from Sicily and close to Tunisia, has seen many rulers and experienced the high technology that comes with being a military base and meeting place of many cultures. Rarely, however, is this technological heritage highlighted, due to its extraordinary historical and pre-historical heritage riches. There are, for example, three World Heritage sites in the space of roughly Washington DC proper. The architecture of the country ranges from he oldest free-standing structures in the world to small flat-roofed farmhouses to glorious examples of Baroque cathedrals to the modern. Indeed, it is not too much to say that one can experience the history of the Mediterranean on the archipelago of islands that is Malta. Many in Malta assume that industrial development began in the 1960s. Yet it had the very best engineers do the fortifications by the Knights of Malta in the 1500s and 1600s. It served as a key naval base for Britain until independence and had an extensive shipyard, along with ancillary manufactures and supply systems to support that huge presence. Many of the systems are built into the living limestone rock. At the same time, people needed to manage water, power, and provide the arts and crafts for everyday living. Only recently has Malta itself realized that it should preserve and conserve its industrial heritage. Our study tour will emphasize some of the works from the early 20th century and from the WWII and immediate Cold War eras. It will include some of the traditional craft technologies, some of the ancient and Knights sites, and offer a few examples of modern manufacturing present on the island. What is Malta Like and How Does One Get There? As one walks down the streets of Malta, it will feel and sound exotic. Flat roofs and limestone buildings dominate the architecture. You’ll hear Malti, the only Semitic language written in Latin script. But the second language is English and virtually all Maltese speak it; the University uses English as its language of instruction. The third most commonly spoken language is Italian. Malta is a member of the European Union, uses the Euro, and is in the Schengen zone (which makes travel among these members states very easy). US, Canadian, Australian, and New Zealand citizens, as well as others, do not need a visa to come to Malta. The best way to get to Malta is by air. There are many flights from European, Middle Eastern and some Asian cities. For Americans, United’s code-share partner, Lufthansa, offers flights to Malta. Weather in late April will typically have highs in the 60F-70F/15-20C range and lows in the 50s (10C). While rain is certainly possible, this month marks the end of the rainy season. One can expect considerable sunshine, perhaps interspersed with a few showers. 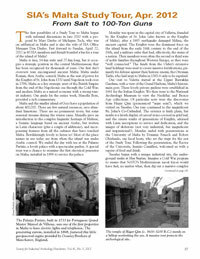 The 2012 Society for Industrial Archeology (SIA) Study Tour was organized by Dr. Ghirlando of the Mechanical Engineering department at the University of Malta and Dr. Mary Durfee, (Fulbright Scholar to Malta, 2007/08), Department of Social Sciences, Michigan Technological University. The tour was further enhanced by assistance from the Rector of the university, Dr. Juanito Camilleri, and by the able efforts of Lucienne Bugeja of University Conferences. Others from the university, from HeritageMalta, local industry, and governments have all contributed to the final result. Afternoon bus tour of the island. Walk to Museum of Archaeology – view of museum and special exhibition ‘Metal Magic’, an exhibition of works of art from the Spanish Damascene Metal.